It’s true, we have made a lot of progress since moving into our house about 7 months ago. BUT, it’s also true that there’s still a lot of work to do around here. So far on the blog, I’ve focused on the living room, dining room, mudroom, and nursery, but there are quite a few spaces we haven’t even touched. Namely the kitchen and both baths on the first floor (not to mention the whole basement, but that’s a story for a different day). How Do You Make the Most Of a Room That Isn’t Your Style? Over the next few months, we are going to gut and remodel our kitchen and half bath. However, we’ve been living with these rooms for quite some time now and we’ll continue to live with the full bath and basement for a while before we can get to them. And spoiler alert, NONE of these rooms are our style. And I think that’s a “problem” a lot of us share — living with spaces in our homes that aren’t our style, but not being able to totally make them over just yet. What can we do with them until it’s finally time to renovate? Are they a total lost cause? I’m here to share my tips for making the most of rooms that aren’t your style! Because it is possible to decorate without renovating and to make the most of these old and outdated spaces! Not the most glamorous post we’ve tackled here on the DIY Playbook but #reallife. I know this sounds so ridiculous, but the first step in not despising these ugly rooms is to accept them for who they are. Such a teacher thing to say, but SO TRUE in this context too. Yes, they may be ugly and not my style, but I’ve really made a conscious effort to accept these rooms that just aren’t me and I feel so much better about living with them. I remind myself that I won’t be living with them forever, but I have to make the best of them for now. Easier said than done (trust me! 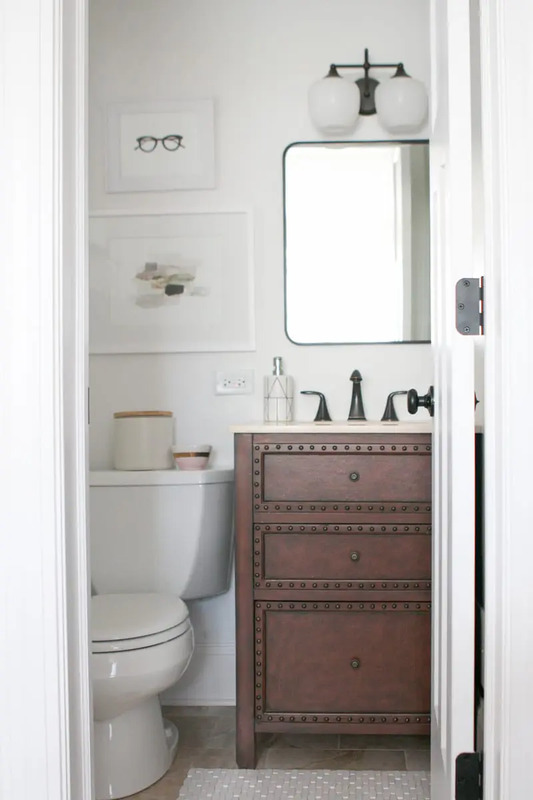 ), but once you aren’t beating yourself up over these rooms, you’ll be much happier. After you’ve accepted living with these rooms, it’s time to dig deep and find some positives! I know, I know easier said than done once again, but something about each of these rooms is positive. The layout? The trim? The wall color? The function of the space? The natural light? Find something that is positive because these positives will make you happier now and will also help drive your renovation later on. It’s actually a good thing that you have time to live with these less-than-glamorous spaces because you’ll learn how you live in them before renovating. This information will drive the changes and will ensure you are creating a new space that is far more functional for your family. Hey… there’s a positive right there! Haha, find something! My kitchen is so not me. 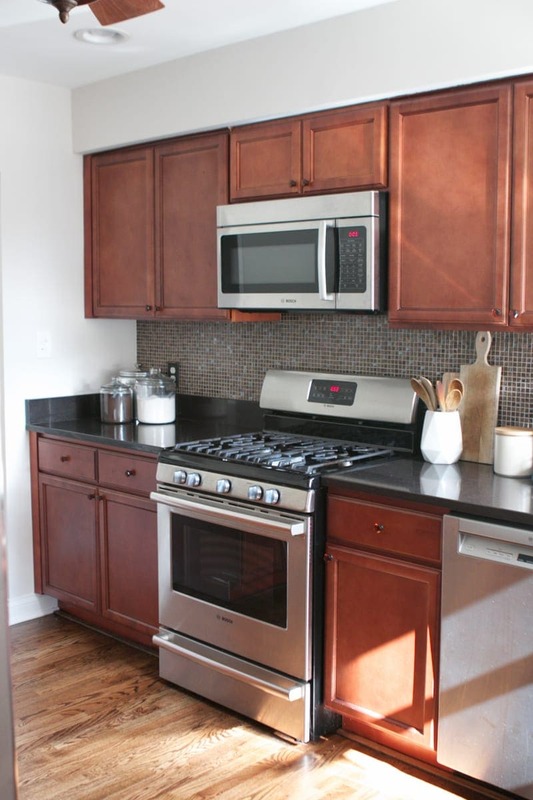 Those orange cabinets, paired with the shiny glass backsplash, and shiny black countertops. Not to mention the dark floors we restained that don’t match at all. But there’s one thing that makes this kitchen even more of an eyesore. Clutter. When the countertops are filled with crap and the place is up for grabs, the not-so-pretty kitchen is even worse looking. But when I de-clutter and give it a good clean, I think the whole place looks 1,000 times better. Sure it’s still not my style, but I stop thinking about how awful it is and start focusing on how clean and organized it is. Maybe that’s some type of sick brain trick, but it works for me! 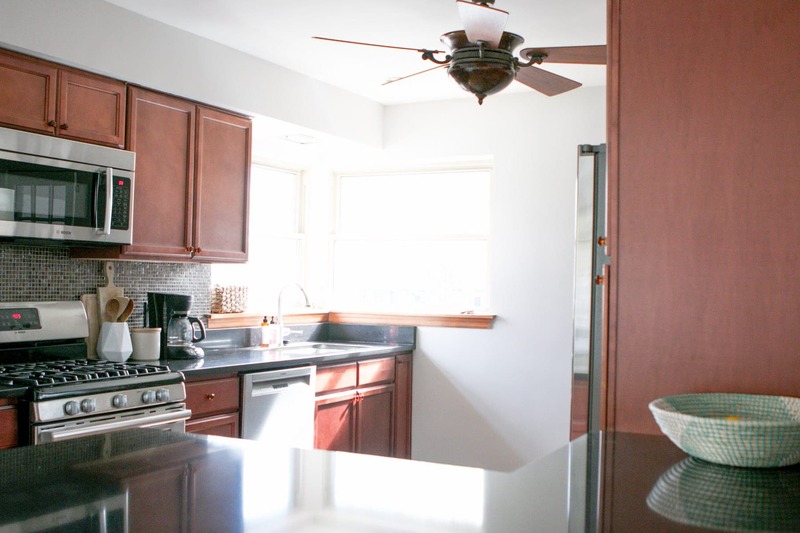 We planned to remodel the kitchen and bath about a year after moving in because 1. budget and 2. we wanted to live in the space and see how we use it before making big-time decisions. While we were finishing our round 1 of remodeling, I decided to go ahead and give both bathrooms a fresh coat of white paint. Did I need to invest in painting them knowing that we were going to change them in less than a year? Not at all. 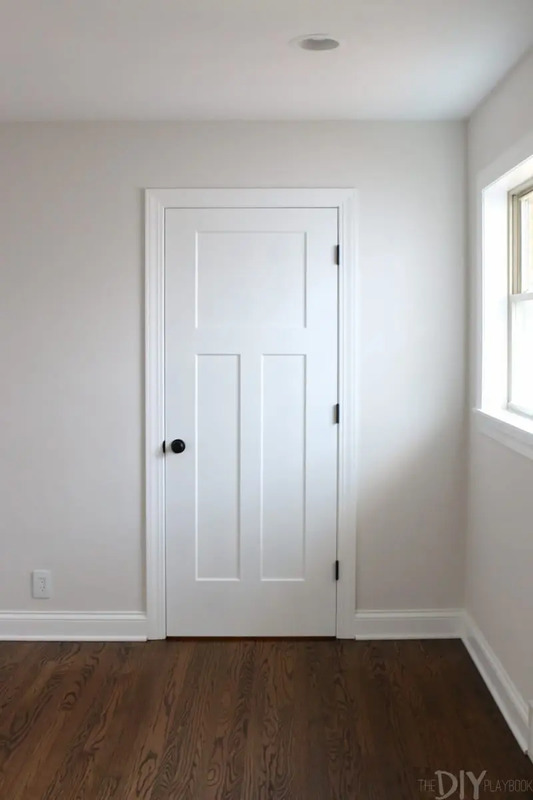 BUT, I’m so glad I did because this coat of white paint actually made both spaces look significantly better. Cleaner, brighter, and a little more me. However, I didn’t invest in new light fixtures or any large purchases because I knew I’d be tearing those out shortly. Your situation may be different so it’s important for you to do what’s best for you. 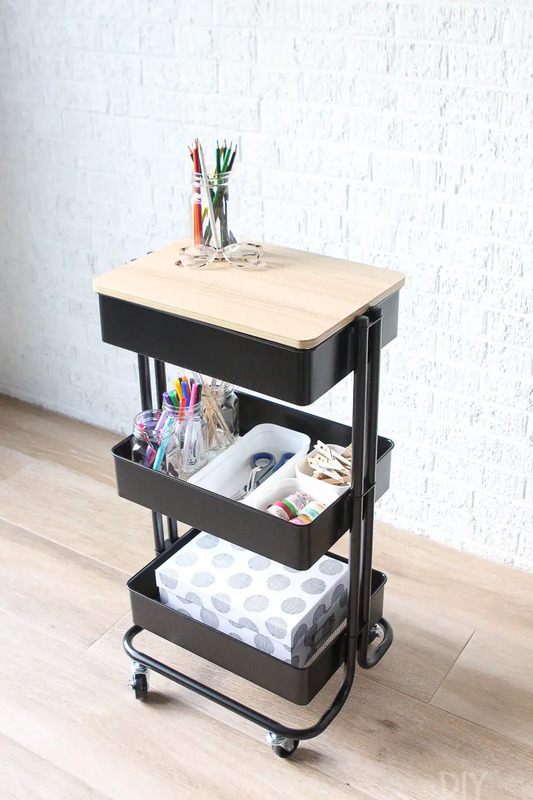 Are simple DIY upgrades worth it for the time being? Maybe a coat of paint, a new mirror, some new hardware, or even a new light fixture will help until it’s time for bigger changes. 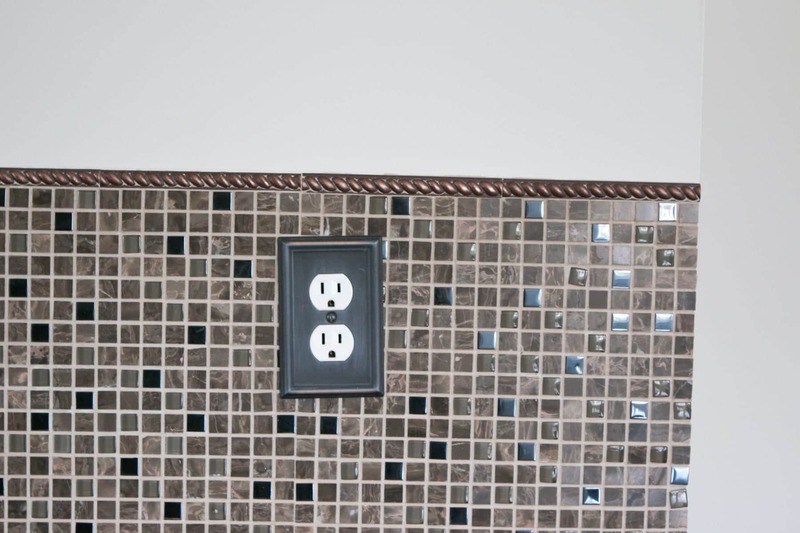 Ugly outlet in the kitchen? Let’s try and hide that. Boring beige tile in the bathroom? Yes, let’s hide that. Lame floor tile? 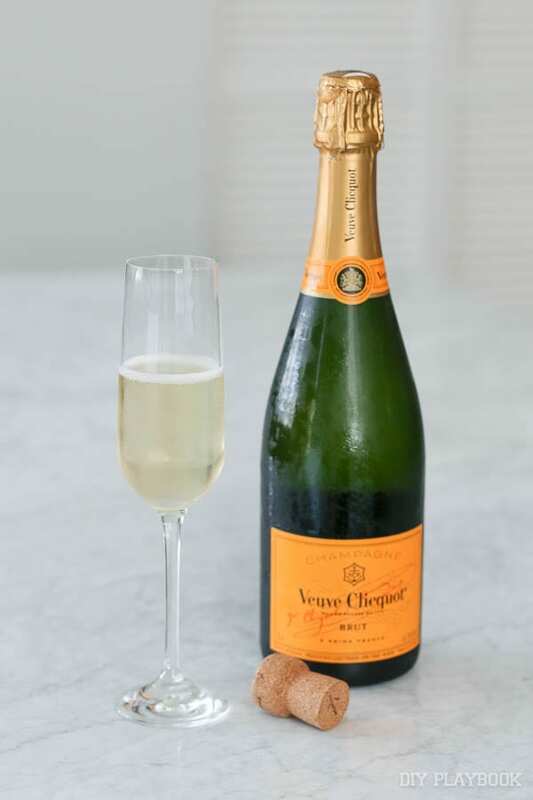 You guessed it… hide it! I’ve done my best to use items I’ve had around the house to hide some imperfections in each room. I also bought an extra long shower curtain that we typically keep closed in the bathroom to hide the boring beige tile. 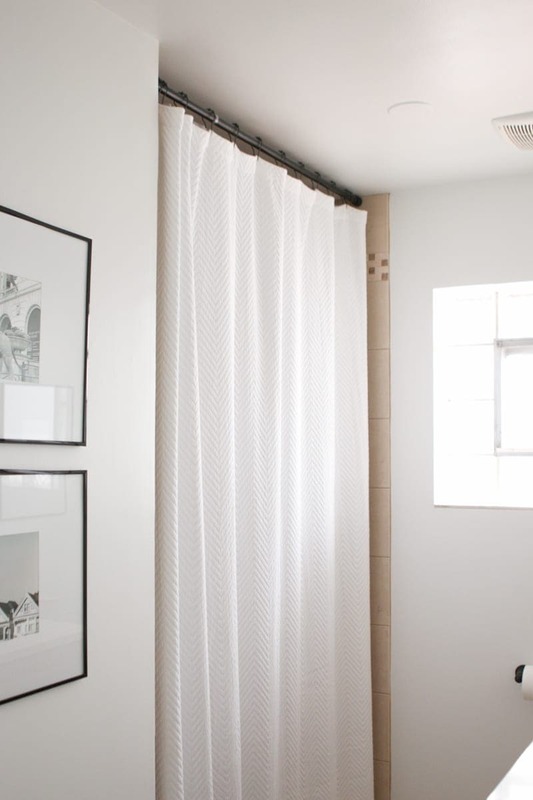 I didn’t mind splurging on this piece because we use it every day and a classic white shower curtain is probably what we will use again after the makeover. 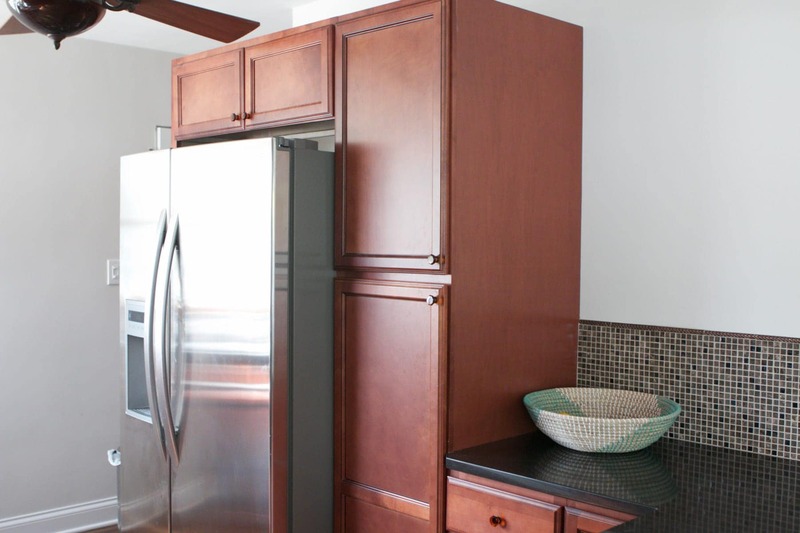 I’ve also used cutting boards, coffee pots, and simple kitchen decor to hide what I can in the kitchen (like outlets). This isn’t a perfect solution, and you want to avoid overdoing it, but don’t be afraid to get creative and hide what you can. Again, you don’t want the place to become a cluttered mess because that makes any ugly room a lot worse. BUT, you can add a few hints of decor that are your style to make the room a little better for the time being. I recycled some frames we had in our old house and hung them in each of our bathrooms for now just to make it feel a little more me. I also swapped out the original mirror for a mirror we already had to try and make the most of the space. 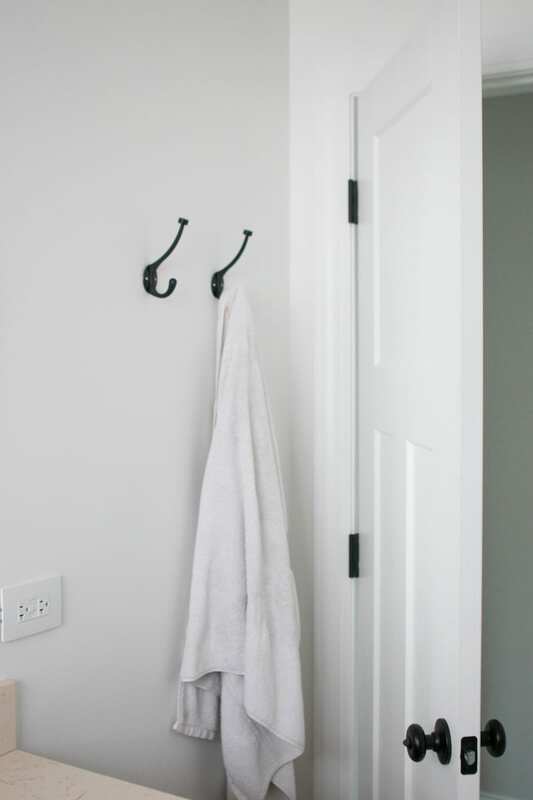 Hooks are also a great (and affordable) way to add function and a hint of your style. 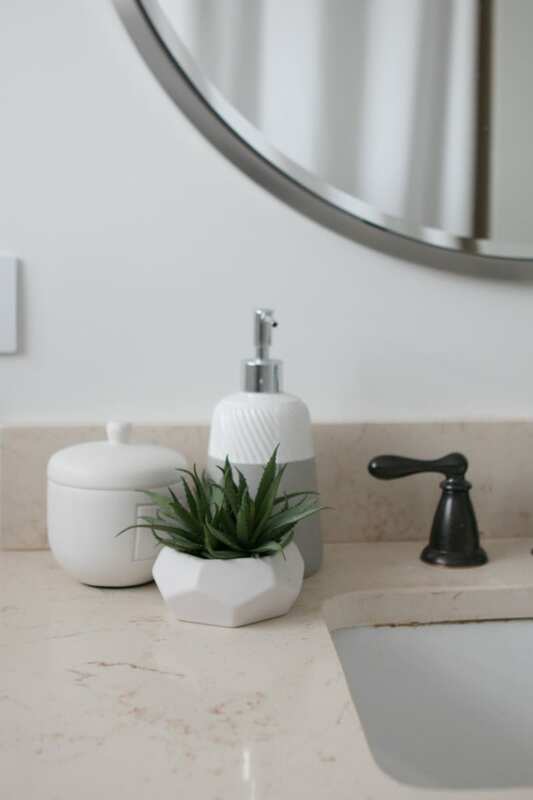 Whatever small touches you can add for now may make the room feel a little more you… and that’s worth it! 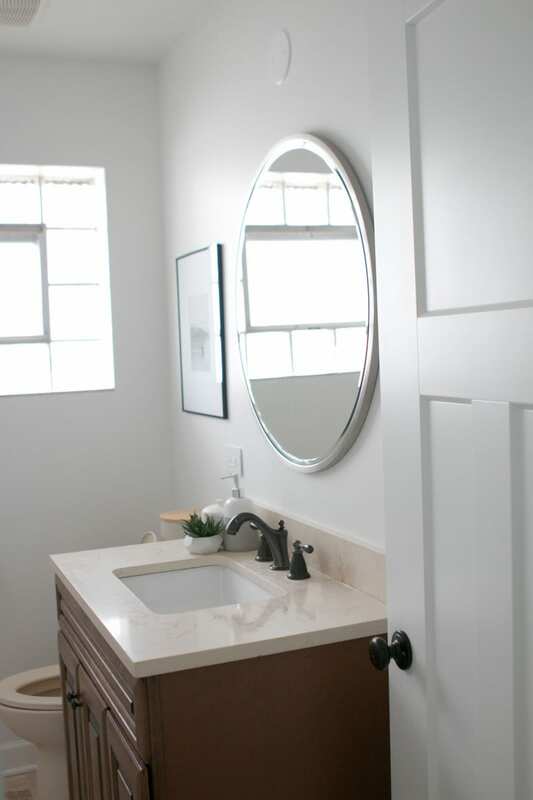 Like I mentioned before, we didn’t want to start on our kitchen or bathroom makeovers until we lived in the spaces (especially the kitchen) and learned how we used them. Because we did that, we learned that we are probably going to get rid of the kitchen peninsula we have now in order to open up space and make our kitchen part of the rest of the home’s open concept. Just learning that and adjusting our plans accordingly makes living with our ugly kitchen for the year WELL worth it in my eyes. 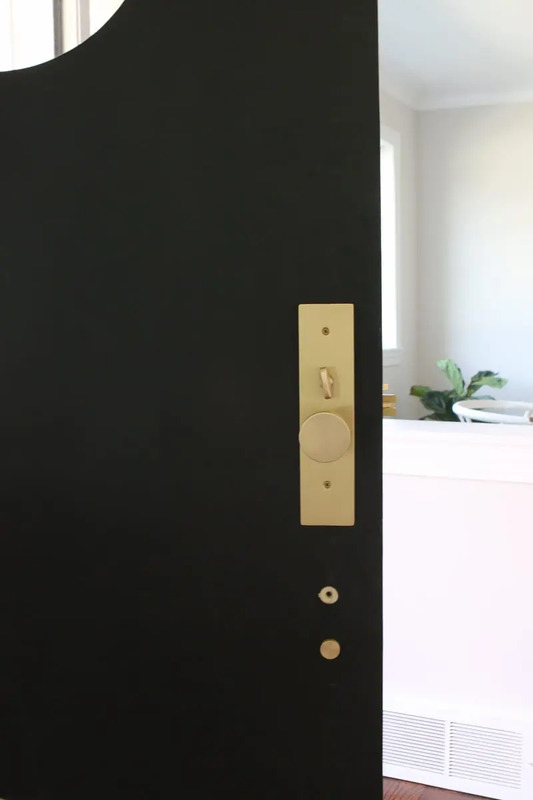 See what you can learn from your spaces, even if it’s what you don’t want next time around. That information is well, well worth waiting for! 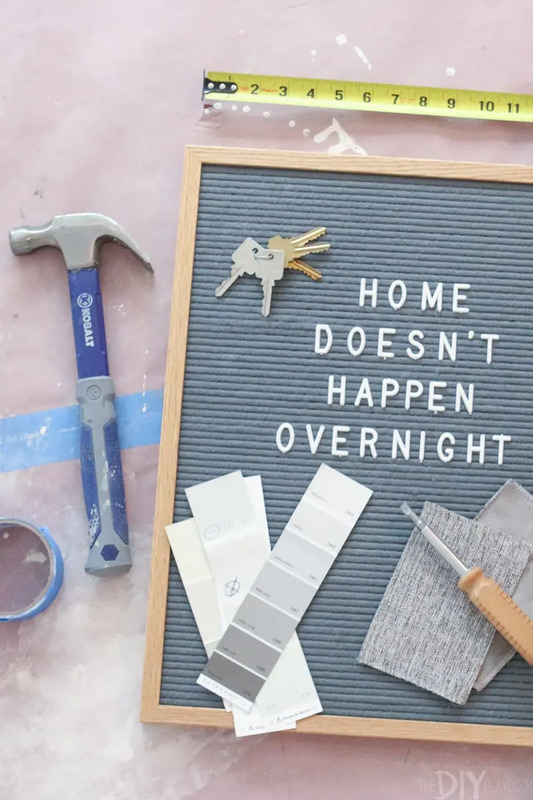 Home really doesn’t happen overnight… not even close! I know it’s easier said than done, but cut yourself some slack and enjoy the ride. You’ll eventually have the chance to make those upgrades, but until then, it’s stupid to beat yourself up over them and hate the spaces you live in every day. Focus on the progress you have made and not all the work that’s left. Over time you’ll get to it and you’ll appreciate the new upgrades so much more because you lived with the ugliness before that.